Milford and Takapuna are located on the East side of the North Shore along the coast. The area is home to Milford and Takapuna Beach which are very popular, great for walks and swims! Parks nearby include Milford Reserve which is next to the beach, Sylvan Park and Killarney Park which are next to Lake Pupuke. If you are looking for shopping, this is the place to be. The Milford Centre offers a range of boutique stores that will cater for your every desire, including Flo & Frankie, Whitchery and Top Shop. The Takapuna mall, surrounding shops and cafes are also a great find. There are several great schools in the area including Carmel College, Milford Primary School, Rosmini College, Takapuna Normal Intermediate and Takapuna Grammer School. Milford is generally thought to have been named by Edwin Harrow who owned a grand 2 storey Edwardian hotel in Killarney Sreet, Takapuna, and originated from Milford on Sea in the south of England. Back in 1928 Ye 'Olde Pirate Shippe' was constructed by James Fletcherin and opened January 1929. 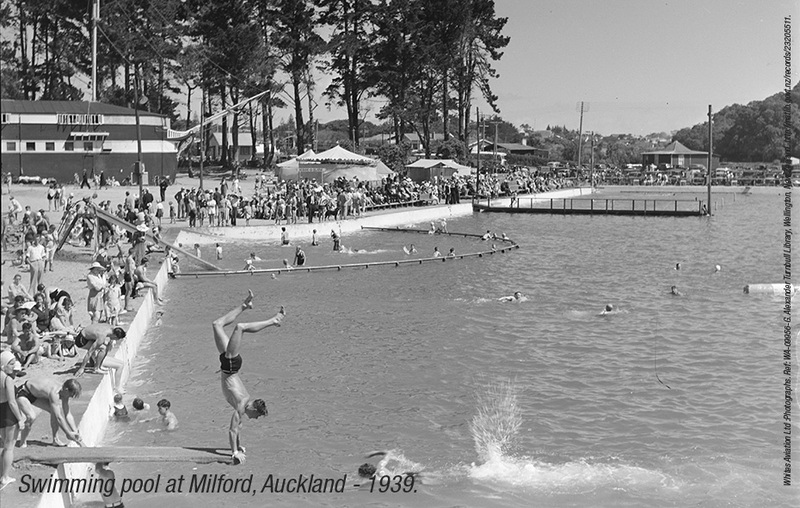 The Milford swimming pool as can be seen in the photos was opened in 1936 and demolished in 1957. The Māori place name Takapuna originally referred to a freshwater spring that flowed from the base of North Head into a swamp behind Cheltenham Beach.